Filming for S4C took place here on 29th Feb with presenters Iolo Williams and Shan Cothi. I hear a helicopter roar over head as night begins to fall. Ahead I see the flash of gunfire light up the steamy forest and my squad hits the muddy ground and returns fire. Am I playing the latest Call Of Duty? No, I’m in the heart of Pembrokeshire at BATTLEFIELD LIVE! I’m a regular “Sofa Soldier” on computer games consoles and relished the chance to shoot my colleagues here at PEMBROKESHIRES BEST, but nothing prepared me for the intense, adrenalin rush that I felt crouched under some bushes in our county. I look down the sights and line up an enemy and squeeze the trigger, I see instantly I’ve hit them as their headwear flashes red. Rewind an hour and we’re being fully trained by their great instructors in how to wield the impressive guns they have (the same models are used by the British Army and Navy to train their ground forces!). It doesn’t matter if you’re a beginner or a seasoned veteran, you’ll all receive the same training to ensure you’re as battle ready as possible. My early confidence quickly evaporated; there are no ‘infinite run perks’ here. All that computer gaming may have sharpened my senses but my legs are numb, my heart is thumping and every sense is heightened as I scan the dense forest for my enemy. This is as close to the real thing as you’ll ever want to get. They also arrange special events from birthday parties, 24 hour sessions and night ops. So, as our session ends, we’re already discussing a rematch for Shaun’s birthday. Despite my aching legs, muddy face and utter exhaustion I agree wholeheartedly! 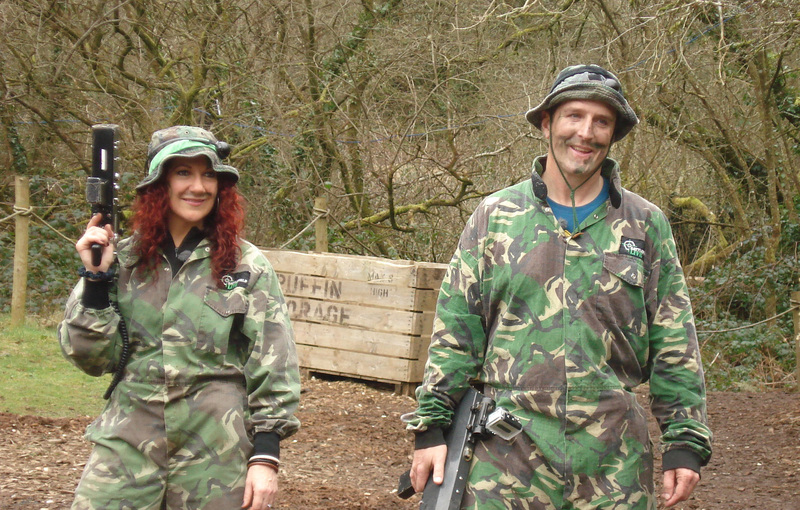 I never thought I’d find such a fun, intense and exciting combat experience in our county, Battlefield Live has all the adrenalin fuelled fun of Call Of Duty but without the sofa, it has all the fun of paintballing without the pain of being hit and it makes for a day out everyone can enjoy. Just remember to keep your head down and your gun loaded! WE NOW OFFER exciting NIGHT COMBAT sessions throughout the year. Our woods take on a whole different feel at dusk and as night falls. To enquire or make a booking please phone Toria on 07777 671301. We are inviting teams/clans of 5 people to pit their wits and cunning against each other here at Battlefield Live, Llanteg until a champion clan emerges who will then represent us in the first ever European Clan War Final. Email pembslivegaming@btinternet.com to register your team. Battlefield Live attended the Family Open Day at RAF Brawdy. Proceeds in aid of Help for Heroes. Here are some pics of the Army Cadets -v- the Air Cadets at the end of the day http://bit.ly/aNLh9n Luckily it was a draw! BIRTHDAY PARTIES IN THE WEEK. Battlefield Live Pembrokeshire was awarded accreditation by Visit Wales as a quality attraction in Wales. Battlefield Live is part of the VAQAS scheme. Pembrokeshire Tourism held their annual Pembrokeshire Tourism Awards ceremony. The most hotly-contested category in the awards was for the MOST EXCITING NEW BUSINESS, which was won by Battlefield Live Pembrokeshire.